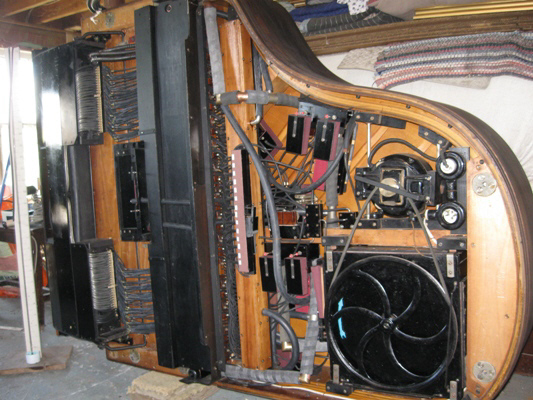 One of the most interesting player piano systems made during the heyday of the player piano was the AMPICO reproducing piano made by the American Piano Company. The player system was installed in fine upright and grand pianos such as Mason & Hamlin, Knabe, Chickering, Fisher and Haines. The system uses a step intensity expression system like the Duo-Art along with a two speed crescendo ability which yields an extremely versatile device to simulate the actual playing of a pianist. The music roll library for the AMPICO is more oriented to popular music as it is said that the Company president, Charles Stodard preferred the salon type of music popular in the 1920’s. The pianists who recorded the special rolls were famous pianists of the day and thus the recordings are of the highest quality. If you are fortunate enough to own an AMPICO equipped piano you have something very special indeed. Restoration of the AMPICO to factory specifications is something I enjoy doing. Send along an email or give me a call and let me know if you need help bringing your AMPICO piano and it’s delightful music back into your life. 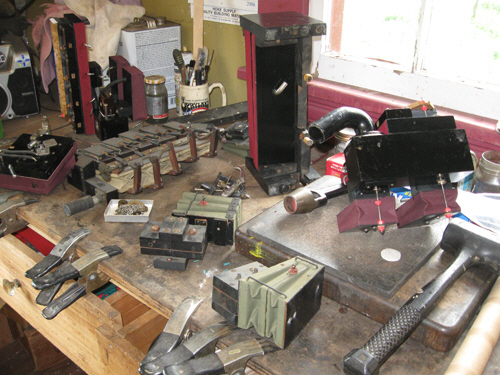 Here are a collection of AMPICO expression and roll drive components on the bench. Expression regulators, a crescendo pneumatic, tracking pneumatic, transmission shifter, air motor, pedal pneumatics and play/re-roll primary box are in this view. 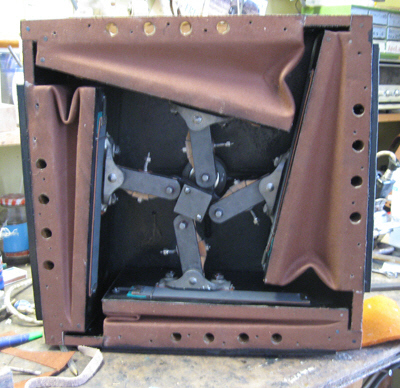 The green fabric seen on the un-restored components was produced in the 1960’s and is a common sight on player pianos of all types that were rebuilt in the 1960’s. 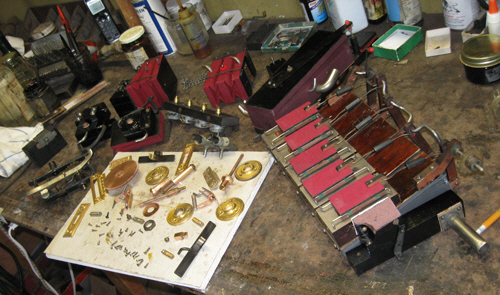 In this view are the restored components of an AMPICO grand drawer. The drawer of an AMPICO grand contains all the necessary units for control and drive of the music roll in a very compact assembly which fits neatly underneath the piano keys and slides back and forth so the player can be cleverly tucked away when not in use. The hardware on the drawer facings are gold plated. Compact indeed! This small space on the right hand side of the drawer contains the logic valves, pneumatics and transmission used to control the music roll operation. 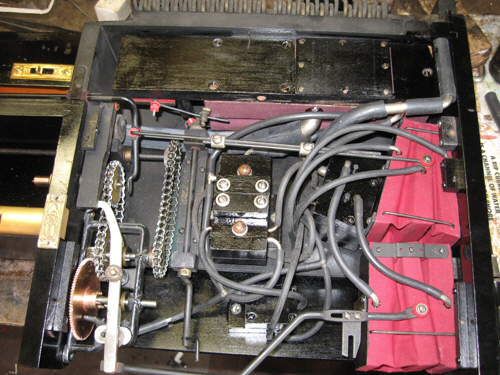 The AMPICO logic deck- Pictured here is the heart of the AMPICO expression system. 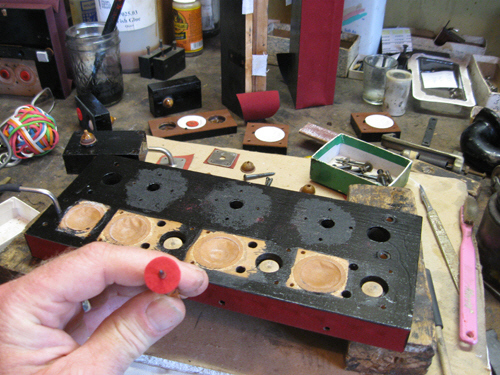 The three small wooden valves recessed into the deck assembly here are the “cancel” valves. I am installing their mating felts which will be used to stop the travel of the valves as they are raised during the cancel cycle. The deck board is a delicate piece of technology full of drilled holes and ports. Great care must be given to valve work in the logic deck to insure a responsive AMPICO performance when the job is done. An AMPICO pump with new pneumatic cloth applied. AMPICO pumps have a reputation for “knocking” as they age. The culprit to blame for the knock is most often associated with the connecting arms between the pneumatics and rotating center. A completed Ampico installation in a grand piano.